Catana’s latest model, the Catana 59, has captured worldwide attention with its unique design that revolutionises recreational catamarans. With more than 26 years of experience and the help of several established firms of naval architects, the Catana 59 is a tour de force with incredibly streamlined hulls, a classically elegant design and astounding performance. The sail plan is borrowed from racing vessels with a short mainsail that is easy to manage and a larger foresail. Moving away from the legendary daggerboards that made the Catana shipyard’s name, this catamaran is fitted with revolutionary curved daggerboards to create a hydrofoil effect. The result is an extremely safe and comfortable boat that achieves astonishing acceleration and an extraordinary cruising speed. Catana is one of the world’s few recreational shipyards that use carbon fibre in the construction of cruising catamarans. This carbon infusion technique considerably lightens the boat and makes it more resistant, resulting in a highly responsive boat that slices through the water at speed. Designed by Chantier Catana Architects, the catamaran is reassuringly strong due its Twaron-Impact construction process. Premium quality aramid fibre is used which is ten times more resistant to perforation than traditional fibreglass. The catamaran’s hulls were specifically designed to deliver impressive speeds while effortlessly accommodating a staggering range of equipment including refrigerator, freezer, desalination equipment, generator, oven, washing machine, dishwasher, wine cellar, television, air-conditioning, heating, diving compressor and much more! Its incredible stability on water, due to its 59 feet and significant headroom under the nacelle, is complemented by its astonishing manoeuvrability. The instruments are all located in the cockpit with the toerails, lifelines and handrails designed for easy, unrestricted movement. Visibility has also been a major focus of attention. The unobstructed 360° view from the cockpit, steering position, chart table and even the salon, guarantees an unparalleled level of safety and comfort. Equal attention has been accorded to the layout of the Catana 59’s interior. The cockpit and saloon are on the same level, with a central area which can be extended into either zone to make space for a large table. The gourmet galley is astonishing with its central island bench, two refrigerators, freezer, oven, hob, dishwasher and expansive work surfaces. A great deal more generous in size than its illustrious predecessor, the Catana 59 has three large cabins and a helmsman’s cabin that can be used as a fourth passenger cabin; the passageways and cabins are more spacious and have more storage space to provide greater comfort on a long-distance voyage. 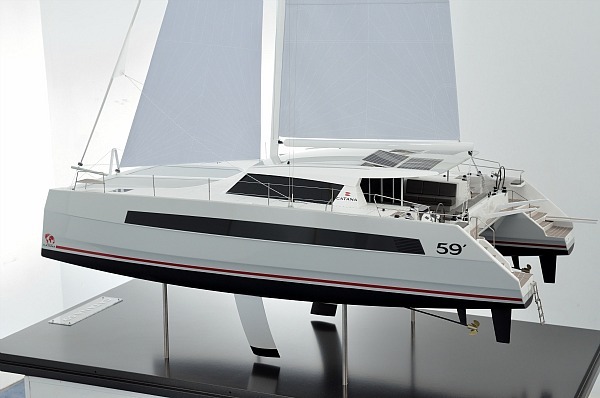 The Catana 59 is priced from AUD$1,935,000 (ex factory). Multihull Solutions is the exclusive Australian and New Zealand importer and distributor of Catana Catamarans. The company is also the exclusive representative for many of the world’s leading brands including Fountaine Pajot, Trawler power catamarans, Sunreef Yachts, Journey and NEEL Trimarans. The extensive choice of style, design and features across the company’s range of brands ensure that clients can find the perfect multihull to suit their exact requirements and budget.